Leading cosmetics brand, Estee Lauder are collaborating with South African's leading fragrance, make-up, and skin-care brand Red Square to promote their gift offer with purchase on all of Estee Lauders products. 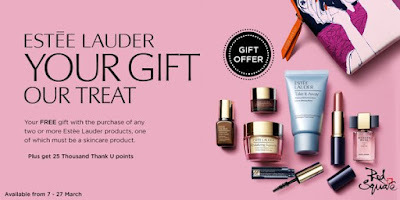 In order to obtain this free gift with purchase you will need to purchase two or more of Estee Lauder's products, one of which has to be from their the Estee Skincare range. And as an added promotion, Red Square are also offering a huge 25 Thousand Thank U points as part of their Thank U Reward Scheme. This gift comes with Estee Lauder's Iconic Printed Gift Bag, which makes this promo offer extremely attractive as a gift with purchase. Take It Away Make-Up Remover, Sumptuous Mascara, a Modern Muse small Fragrance, Night Repair Products, and Revitalizing Anti-age Cream. Why do cosmetic gift sets make good gift with purchase ideas? A promotional gift can help increase the sales of your products. This marketing technique is particularity great for promoting new and less popular products. They can improve customer loyalty and perceived value. A well established brand can afford to give their customers higher quality gifts. Therefore, if customers feel positive and feel like they are getting more for their money they will continue to stay with your brand in the future. Furthermore, cosmetics as promo gifts are very practical and have a long product life line. This gift bag can be re-used for many different purposes, be it at home, for work, or for going on holiday with, and it is this practicality promoted with a great design that will increase your product sales.